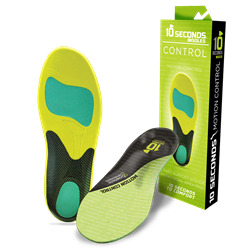 Athletes after a winning advantage, here is the insole for you! The New Balance Motion Control Insole features Abzorb heel and forefoot cushioning, metatarsal arch rise for added support, external heel stabilizer & arch reinforcement, deep heel cup, and an anti-microbial/anti-blister top fabric. Perfect for anyone looking to add extra comfort to their shoes.